A mini tummy tuck after pregnancy is a surgical procedure that removes excess skin from the abdomen to create tighter, smoother contours in the tummy. When the skin expands to accommodate a pregnant belly, it unfortunately doesn’t always retract after childbirth. If the skin has stretched, there is no amount of diet or exercise that will reduce its bulk. A mini tummy tuck is usually performed during a Los Angeles mommy makeover when excess skin has accumulated only below the belly button. A mini tummy tuck will effectively eliminate this excess skin, leaving you with a stomach that is smooth and lean. The mini tummy tuck is called "mini" because it addresses less area on your belly as opposed to a fully tummy tuck that addresses the areas of the mini tummy tuck in addition to severe muscle separation. In determining candidacy for a mini tummy tuck during a Beverly Hills mommy makeover, there are several factors to consider. A good candidate for a mini tummy tuck has accumulated some loose, sagging skin on the tummy below the belly button, generally after pregnancy or significant weight loss. Such a patient may have some mild excess skin above the belly button, but this will not be addressed during a mini tummy tuck. For this reason, you and Dr. Rahban must agree whether this procedure is appropriate for your cosmetic goals. As the belly expands during pregnancy, it does not only affect the outer skin—it also stretches the underlying abdominal muscles, known as the abdominal fascia, hence creating rectus diastasis. When this occurs, the muscles tend to bulge outward, creating a pooch and unflattering appearance. That being said, during a mini tummy tuck after pregnancy, the muscle separation is not often addressed. The reason is that if you address only the bulge below the belly button and not the bulge above the belly button, you will have a weird pooch above the belly button, creating an uneven appearance. If a patient has a significant muscle bulge, a full tummy tuck is necessary to get access to the entirety of the abdominal muscles. When it comes to the stomach, stretch marks are an extremely common problem. There is no treatment that has been proven to reduce stretch marks, beyond surgical removal of the offending skin. If your stretch marks fall within the area being excised, they will be removed. The stretch marks that are left behind often look better when there’s tension from the stretched abdominal skin. No other treatment, such as lasers, creams, etc., has been proven to work. During a mini tummy tuck consultation, Dr. Rahban covers several crucial points. Firstly, he gathers data regarding your specific cosmetic objectives. After all, the goal is your satisfaction and confidence. Plastic surgery is all about what you are trying to accomplish. Just because a surgeon likes a result, it does not mean you will like it. In all plastic surgery, you are the unique element in the equation. Second, after an examination, Dr. Rahban defines the exact problem, allowing you to better understand what your body has been through. Next, he lays out your options, including incisions, amount of skin to be excised, and other factors, including which procedure(s) will produce the best results—liposuction, mini tummy tuck, standard tummy tuck or a combination thereof during a mommy makeover. Dr. Rahban will be with you every step of the way to guide you towards the right option for you and thus ensure beautiful results from one of the best mommy makeovers Los Angeles has to offer mothers. During a consultation, Dr. Rahban has one primary purpose—total patient education. He wants each patient to fully understand the nuances as well as limitations of mini tummy tucks post pregnancy, as well as every risk and exactly how the procedure applies to them, allowing them to make the best decision for themselves. During a consultation, he’s more interested in telling his patients what the procedure won’t do, rather than what it will do. With his honest, candid approach, Dr. Rahban brings a new level of care to ensuring his patients know exactly how a mini tummy tuck works. The incision is made. Because a mini tummy tuck only targets excess skin below the belly button, it is much shorter than a full tummy tuck incision. In delivering a mini tummy tuck, Dr. Rahban places the incision as low on the abdomen as possible, allowing it to be hidden by underwear or bikini bottoms. Once the incision is made, Dr. Rahban will release your skin and fat up to the level of your belly button. Then he can recruit and excise as much excess skin as necessary. Next, Dr. Rahban pulls the excess skin down, allowing him to see exactly how much excess skin should be removed. While one may think that more is better, this is where Dr. Rahban’s decision comes into play. If too much skin is excised, your pubic hair and incision will be pulled upwards above your underwear line. Your scar will be under tension and thicken, and your abdomen will look shorter. Dr. Rahban carefully removes excess skin, leaving just the right amount for the abdomen to look naturally fit and firm. Next, Dr. Rahban closes the incision. At many cosmetic surgery facilities, the surgeon allows another person to close the patient. This is not the case with Dr. Rahban—he doesn’t let anybody else touch his patient. His closing techniques are exquisite, using an enormous number of sutures so very little tension is placed on any single suture. With minimal tension, the resultant scar is virtually invisible. With layered closer, Dr. Rahban ensures the transition between abdomen and pubis is smooth, not creating an additional ridge or lip. He takes the extra upper skin out so it sits flush with the lower skin. As an added precaution, Dr. Rahban closes starting from the hips and works his way into the center of the abdomen. This ensures no dog-ear deformity is present. A mini tummy tuck with Dr. Rahban takes 2.5-3 hours, but will vary if this procedure is part of a mommy makeover. For patients receiving a mini tummy tuck, preparation begins about two weeks before the procedure. Every patient goes through a thorough pre-operative process. This begins with a pre-op visit two weeks prior to surgery. This is similar to a second consult. During this time, you will go over the details of your surgery with Dr. Rahban, and you will get a second opportunity to ask questions and go over your procedure, thus ensuring a complete understanding. Directly after a mini tummy tuck, you will remain in our recovery suite for an hour until you are ready to go home. Because the effects of anesthesia do not fully wear off for 24 hours, you will need assistance during this initial period, including a ride home. If you are alone in the city, Dr. Rahban and his staff will make arrangements for individuals who can help you throughout your process. At home, it is wise to set a centralized location to relax, with medications and other necessities within easy reach. During the first week, you must use your abdominal muscles as little as possible. If you live in a house with stairs, it is best to avoid them if possible. Post partum mini tummy tuck patients need to sleep in what we call the lawn chair position. By bending at the waist, you will ensure your incision is not under tension while it heals. This also means that patients must walk bent over for the first week. Additionally, you will not be able to drive for the first week following surgery. Driving is allowed once you can respond to oncoming traffic, usually one week after surgery. When receiving a mini tummy tuck, the healing process is crucial to a beautiful result. For this reason, our office will ask that you strictly adhere to our list of post-operative guidelines. It’s of paramount importance that you do your part. Dr. Rahban and his staff will hold you accountable to your portion of your own successful recovery. We will give you a full list in our office, but below are several examples so you know what to expect. You will have two small drains following a mini tummy tuck, which will help eliminate fluid that is accumulated in the space created during the surgery. The drains will most likely be removed within 4-7 days, depending on the degree of fluid generated. Dr. Rahban’s approach to drains is unique. Most surgeons use a completely separate incision for the drains, usually in the mons or the patient’s sides. The obvious problem with this is it creates new scars in addition to the primary mini tummy tuck scar. 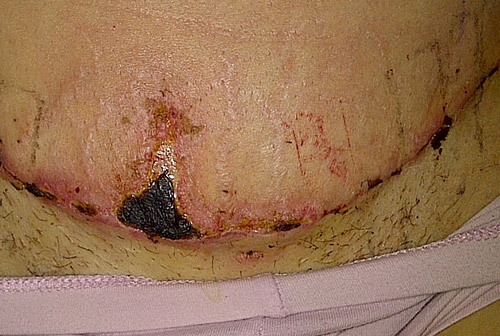 After a mini tummy tuck, the last thing a patient wants is a circular scar in the pubic area. Dr. Rahban uses the existing incision for the drains, preventing the need for further incisions and scars. After a mini tummy tuck, Dr. Rahban schedules a total of five follow-up appointments. Most plastic surgeons schedule two follow-ups, during which time you may not even see the doctor. During every follow-up appointment, Dr. Rabhan sees his patients personally. He believes it is the patient’s responsibility to follow up with him. This is because patients may not know something is wrong until they see a professional. From Dr. Rahban’s viewpoint, plastic surgery is a team approach, and you must do your part by showing up to your follow-up appointments. This occurs when the tissue, such as the belly button or the edge of your wound, does not receive sufficient blood supply. When this happens, that tissue cannot survive and will die and turn dark, necessitating excision or removal of that tissue. Several factors that lead to this include smoking, poor health such as heart disease and diabetes, or excessive tissue dissection by your surgeon. In order to minimize this complication, Dr. Rahban requires his patients to quit smoking a month prior to surgery and generally be in good health going into surgery. His primary action, however, is to be conservative with his dissection during your mini tummy tuck. 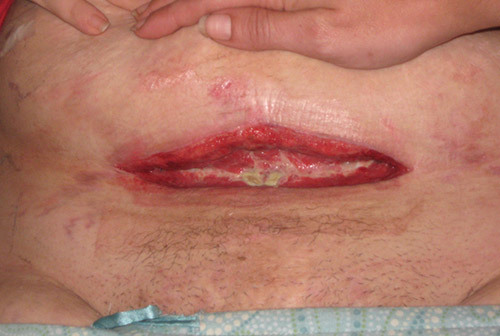 This can occur if the wound is closed too tight or not closed well enough. In order to minimize the potential of wound separation, Dr. Rahban is very careful with how much skin he removes during your mini tummy tuck. All too often, surgeons are overly aggressive, removing too much skin, thereby putting too much tension on your scar. This can lead to separation of your wound. “Number one, it’s really important that the incisions be placed very low. All too often they ride high, and after the entire procedure is done, you still can’t wear your bathing suit. “Number two, it’s very important that you’re not overly aggressive and take out too much skin because then you have what’s called a shortened abdomen. There is no standard cost for a mini tummy tuck as there are many unique variables. Below is a list of the elements that will determine the cost of your procedure so you understand what exactly you are paying for. How long it takes to perform the procedure. Generally the faster your surgeon, the less facility and anesthesia fees and the greater the surgeon’s profit. Therefore, surgeons have an incentive to work more quickly. When it comes to surgery, faster is not better. Be sure to ask your surgeon how long the procedure will take and be wary if it seems too quick. The average time for a mini tummy tuck is: 2.5-3 hours. This timeframe will change if it is performed as part of a mommy makeover. As the belly expands during pregnancy, it does not only affect the outer skin—it also stretches the underlying abdominal muscles, known as the abdominal fascia, hence creating rectus diastasis. When this occurs, the muscles tend to bulge outward, creating a pooch and unflattering appearance. That being said, during a post-pregnancy mini tummy tuck, the muscle separation is not often addressed.